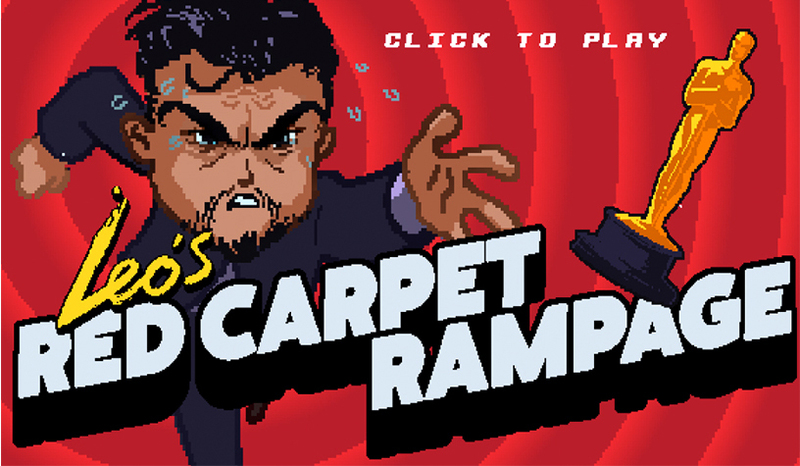 Leonardo DiCaprio's Red Carpet Rampage - Best Game Ever? We’re all rooting for Leo this Oscars’ season but, unbelievably, he hasn’t been lucky with his Academy Awards wins. But now, some genius developers have made a seriously addictive game out of Leo’s Oscar-struggles and it’s sooo much fun. Yep, Leo’s Red Carpet Rampage takes note of the fact that the actor has been nominated for an Oscar four times, and invites you to be Leo and out-race half of Hollywood down a virtual red carpet in order to snag that coveted golden statue. Obvs… we’re already addicted to this, because there’s different challenges and bonus levels such as; avoid tripping over Lady Gaga on the red carpet (inspired by the hilariously awks Golden Globes incident), jump over the paps, race Leo’s little legs faster than his A-list competition (Bryan Cranston, Matt Damon) and even a round where you have to locate a black Oscars-nominee in a crowd. (Something tells us that round is particularly tough). And yep, other tasks include trying to write Leo’s acceptance speech, making Leo ‘act harder’ and of course, avoid a Titanic-style Iceberg. We can just imagine Leonardo DiCaprio hunched up on his phone on the night of the Oscars, (playing himself) in order to get in the zone. And it’s not that hard to imagine because the actor has been on a mammoth PR tour for his latest film, The Revenant; attending all the industry events in the run-up to the Oscars (winning at the BAFTAs) and even chatting in Italian in a public meeting with the Pope. Whatever it takes eh, Leo?